While trying to get to the bottom of a SQL Server performance issue, on many occasions I’ve seen engineering teams and in some cases DBA’s start focussing on perfmon counters to determine where a SQL performance issue is coming from. Performance counters quite often will report symptoms of a performance issue and can many times lead you down the wrong path. In this post I will explain what wait events are and how they can help you determine the root cause of a performance issue more quickly than by starting with looking at performance counters. The elapsed time of a query can best be broken down into the sum of the wait events it encounters + the CPU time of the query. It is important to note, CPU time is not a wait event. The timeline below helps illustrate what an individual query execution might look like when taking wait events and CPU time into account. In the timeline above, the update query is submitted to SQL Server. It first consumes 5 milliseconds of CPU time. Eventually the query does some physical IO which causes it to wait 10 milliseconds (PAGEIOLATCH_EX). Next the query runs into lock wait (LCK_M_U) which causes the query to wait for 3,000 ms. After the query obtains the lock it is able to complete after 7 milliseconds of CPU time. From this we can see what the query is doing for the duration of the execution. Based on this knowledge you can take appropriate action to resolve the performance bottle neck (i.e. find the blocking session causing the lock wait). I’ll mention this now, but the above scenario is slightly different for parallel execution plans. I have another post discussing this. I’d recommend reading through this post prior to getting into waits related to parallel execution plans. I will discuss the first two options in this post. The other two I will discuss in future posts since there’s enough to discuss on the sys.dm_os_wait_stats and sys.dm_exec_requests in just this post. What is sys.dm_os_wait_stats, and why isn’t it the best way to view wait events? The first point is the harder of the two to address unless you happen to be on SQL Server 2017 or Azure SQL Database. If you are not on one of these releases you will need to query sys.dm_exec_requests to see what an executing query is currently doing (waiting on something or using CPU). The value of knowing what queries are affected by what wait events helps eliminate a lot of noise. The above query returns all wait types ordered by the sum of wait time (descending). What’s interesting about the output is the first wait event that is actually affecting my workload is in the 18th row returned (WRITELOG). In other words there is a lot of noise you need to sort through to look for wait events that are actually impacting user processes. The second point you can work around to some extent. You can log the output from sys.dm_os_wait_stats and perform deltas via a scheduled job in order to historically collect wait stats at scheduled intervals. If you find yourself going down this path you should probably consider purchasing an APM tool. You can query sys.dm_exec_requests to see a request that is currently executing. This will show you what the current wait event is, what query is executing, and how much CPU the executing request has consumed since it started executing. We use sys.dm_exec_requests to retrieve what is currently executing. We use sys.dm_exec_sessions to filter processes which are user processes (as opposed to background processes). We use sys.dm_exec_sql_text to get the text of the query currently executing. We use sys.dm_exec_text_query_plan to retrieve the execution plan of the query currently executing. When a request is in a suspended state it is currently in a wait event. You will see a value in the wait_type column indicating the type of wait event that is occurring. The wait_time will indicate how long the current instance of the wait event occurred. In this example we were in a PAGEIOLATCH_EX (waiting on physical read) for 2 milliseconds. It should be noted, there can be many short wait events that add up to a sizable amount of the total elapsed time. Unfortunately there is no simple way to see the cumulative amount of wait time for short wait events unless you are on SQL 2017 or Azure SQL Database. If you run this query multiple times back to back and consistently see the query registering the same wait event type (i.e. PAGEIOLATCH_*) it gives you a pretty decent picture of where your query is spending its time (waiting on IO). Is my query doing too much physical IO due to a bad execution plan? Is my physical disk performance causing slow IO? Do I need to increase the memory available to SQL Server to ensure data is cached in the buffer? As you can see, we were able to identify as closely as possible a good approximation of what our query is doing when it executes. This means there are 385 ms likely being spent in waits. You would have to run our query against sys.dm_exec_requests a few more times to see what wait_type shows up to take an educated guess as to what waits this query is experiencing. We can see that this query is in a runnable status. When a query is in a runnable status it means it is not in a wait event, but it is actually queued up to get some CPU time. There is a wait type, SOS_SCHEDULER_YIELD, that I’ve heard people equate with waiting on CPU. I don’t think that’s totally accurate. The SOS_SCHEDULER_YIELD wait type occurs when a request using CPU yields usage of CPU in order to allow other requests to execute. This might appear on a really busy system with lots of processors but no real CPU pressure. I’ve found that a better indicator of CPU pressure is to watch for a large percentage of requests appearing in a runnable state whenever you query sys.dm_exec_requests. This means there are not enough processors to service the query workload and requests are trying to get CPU time but are consistently unable to. I’ve mentioned the Azure SQL Database and SQL 2017 query store a couple times and thought I should point this out. The query store assumes SOS_SCHEDULER_YIELD is CPU wait. In Azure SQL Database this might be a slightly more representative measure of CPU wait since it appears that Azure SQL Database yields more often when in lower DTU levels; however, this doesn’t seem to be quite as accurate from non Azure SQL Databases. LCK_* Long Most of the time these are longer, but on occasion a lot of short lock waits may appear. PAGELATCH_* Short Under high contention for PFS, GAM, or SGAM pages these can be high, but normally they are very short since they are just synchronizing access to pages in the buffer. RESOURCE_SEMAPHORE Long On occasion this will be short, but usually they are long when they start appearing. WRITELOG Short On very rare occasions these can be long. That’s great, but what if the performance issue isn’t currently occurring? As I mentioned earlier, if you are on SQL Server 2017 or Azure SQL Database you can use the new Query Store feature to view query level wait events in the past. If not you may want to consider purchasing an APM tool capable of monitoring query level wait events (Ahem… SQLGrease). Just the other day I was asked to look at an issue occurring at a client. Users were complaining about long query executions. The server engineers involved could not find an obvious problem. The DBA involved didn’t see anything that indicated a health issue with the database. The problem was bounced around for about two days between different groups until I got involved and followed the process I described above. Within a few minutes of diagnosis work we determined user queries were stuck in IO waits (PAGEIOLATCH_*). At this point we were able to research via perfmon counters which disks/luns were experiencing issues and come up with a solution to fix the problem. The key to the solution was identifying the problem queries and what waits were affecting them. Wait event analysis isn’t the end all be all for analyzing performance issues. Having the ability to view execution plans as they executed when performance issues occurred is another important piece of the equation. I’m also not discounting the value of using perfmon counters because they can be helpful in diagnosing an OS or hardware issue. 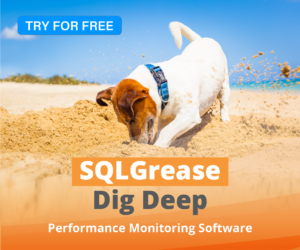 How can SQLGrease help you get to the root cause of your performance problems? Watch our demo video. < Previous Is your system_health session missing data?